Today I am 39 1/2. We're big into fractions at my house. My daughter is currently 4 5/6 and my son is 6 2/3. At what age will they just be a whole number all year!? 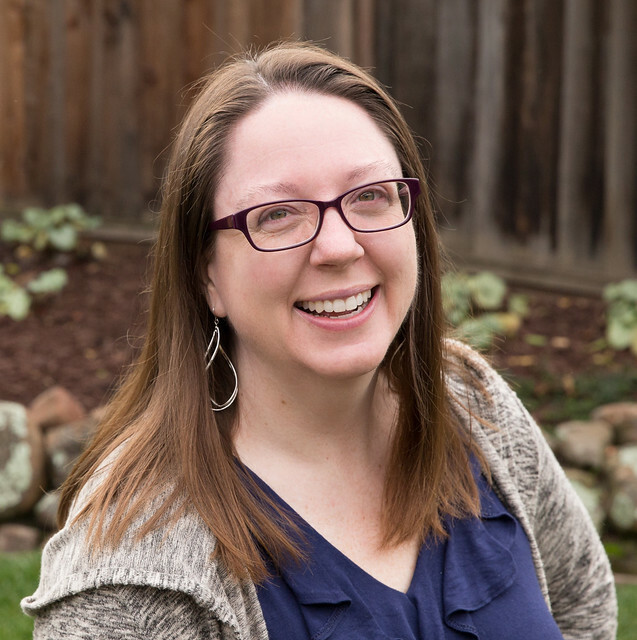 Recently, I won a spectacular giveaway from Jamie and Jill of Sunflower Quilts. I had been eyeing their Thread Cutter as I love to chain piece and I think it would be a great tool for the kids to use. (My son is already a fan of chain piecing.) 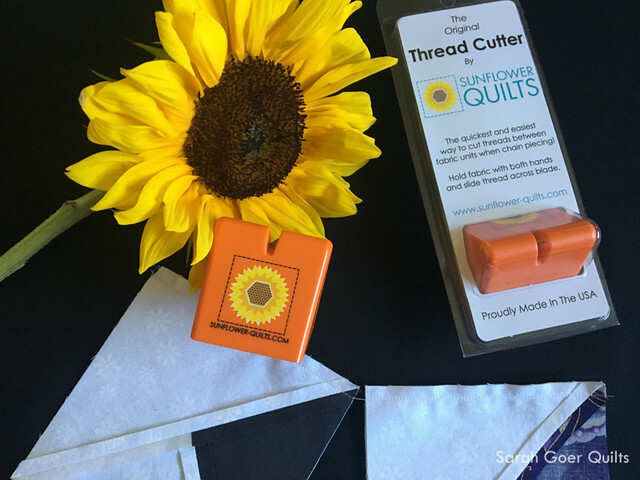 You can see a little video of how it works on Sunflower Quilts. It's super easy to use. My only tip is to make sure to take a couple stitches between each piece to give enough space to easily cut without pulling out any stitches at the edge of your piecing. I've been using it on my current projects, but my kids haven't been in the sewing room lately, so they have not tried it out yet. I'm loving it! One-Year Blogiversary WIP Wednesday: Kids, Stars and Bees Blogiversary Giveaway Winner Dot Crazy Blog Hop and Giveaway! Posted in Uncategorized on April 6, 2017 by sarah. Happy half birthday! My favorite tool right now is the add a quarter inch ruler. I am working on the block if the month from The Quilt Show which is a paper piecing project, and I am using it to trim the papers. I would love to win the thread cutter. Thank you. Happy 1/2 Birthday! I could really use a cutter, I do a lot of chain piecing. This would be a great addition to the sewing room. Much better than the seam ripper currently being used for this task. Happy Half Birthday! A tiny hook crochet hook is my favorite. It can do so many things. Help tie a knot; get lint out of iron holes; help push small fabric through the sewing machine, etc. I love my rotary cutter and mat. They are so much quicker and accurate than scissors. I follow you on Bloglovn and now the newsletter. Happy 1/2 birthday, one of my favorite quilting tools is the bloc loc rulers, I used to hate making half square triangles but now not so much. My favorite tool is a small pair of thread snips I use them all the time. But this tool might replace them. The quarter inch foot with an edge is a great tool, especially when I'm a bit tired and want to keep quilting. Happy Half Birthday! Lol. This is such a fun giveaway. When I sit down to sew I HAVE to have my snips with me. I'd feel lost without them. Thanks for the chance to win! My can't-live-without-tool is my Olfa quick-change rotary cutter. My first rotary cutter had a washer in its assembly. Oh no, I ditched that cutter as soon as I found the quick-change ones! I follow you through email, Bloglovin', on IG, and most recently through your awesome newsletter! My all around favorite quilting tool is blue painter's tape...so many quilting uses!! And I follow you via blog, newsletter, facebook, IG and our 1:1 chats!! I follow on Bloglovin. When you reach my age you feel like you should celebrate every day you wake up. Happy Half Birthday! What a great tool. I just watched the video. It's so hard to choose just one tool...I think my tweezers. I use them to pick up loose threads in seams that I can't grab, or pull my thread through the needle if I can't grab it, and use it as a stiletto. The sewing machine, the ultimate power tool, is my favorite quilting tool. LOL But I could not live without a seam ripper. Thanks for the chance to win! I receive your newsletter is how I keep up with you! My favorite tool right now is the bloc loc rulers. I was avoiding half square triangles but these rulers really help so much. Happy half birthday! I follow you through the newsletter. I'm currently loving my bloc loc 1/2 square triangle ruler which is a good thing because it cost an arm and a leg. I'm getting your newsletter and I believe I follow on bloglovin as well. I can't live without my creative grids rulers! I follow you now on Instagram ! Ooooh, I've been wanting one of those! I have a lot of favorite tools, including Wonderclips, great scissors, and a small ruler to check seam allowance as I sew. I could go on, but I won't... Happy Half-Birthday! Favorite tool would be my iron. I enjoy ironing as I go along.